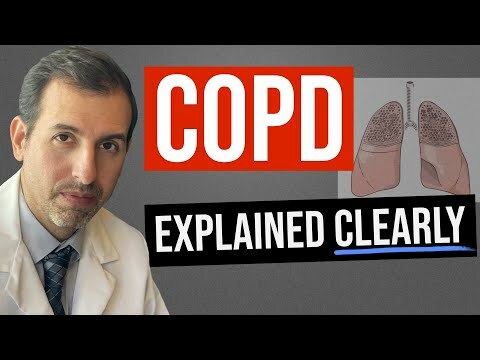 COPD Emphysema is one of the two major forms of Chronic Obstructive Pulmonary Disease, which comes about when the alveoli become damaged. Those are the tiny sacs in the lung that exchange oxygen into the blood and carbon dioxide out. Think of the airways and lungs as an upside down tree, with a trunk being the trachea or windpipe, the branches are the bronchi, twigs are the bronchioles, and the leaves alveoli. Air flows into the trunk, passing progressively down until it reaches the alveoli. Under normal circumstances, oxygen moves in and carbon dioxide moves out. However, cigarette smoke, industrial chemical exposure, and other irritants can damage the walls of the small sacs, reducing the efficiency of the gas exchange. COPD Emphysema makes the alveoli lose elasticity as inflammation sets in. The sacs become less effective at emptying air because they do not contract far enough. That leaves gas trapped inside them. Since that gas now has less oxygen and more carbon dioxide, it does not supply the blood with needed fresh oxygen and clear out the old carbon dioxide as much. In addition, it takes up space that would be occupied by incoming oxygen-rich air. The net result is a feeling of shortness of breath, called dyspnea, especially under mild exertion. Tragically, the disease is often progressive. More and more alveoli enlarge, making them less elastic. A healthy lung will have about three hundred million of these tiny sacs, but COPD emphysema will, over time, reduce that by up to fifty percent or sometimes more. As that gas exchange capacity is reduced, an individual has to exert increasing effort to expel air, to take in fresh oxygen and release carbon dioxide. The effort itself becomes increasingly uncomfortable. At the same time, because the body has less oxygen, fatigue sets in sooner than normal under conditions of moderate activity. A chronic cough is common but not always present. It can easily be confused as a sign of chronic bronchitis, a disease that often occurs in conjunction with emphysema. In the case of COPD emphysema, it much less often produces phlegm. Even here, though, because both forms of COPD make a person more vulnerable to lung infections because of the tendency to retain excess mucus, either may produce yellow-green sputum as a secondary effect. Since oxygen is required for all muscular activity, even eating may become difficult. In addition, while eating, breathing is reduced. When a person eats, the stomach expands, pushing up the diaphragm which is the major muscle used to expand the lungs. That compresses the lungs, making it harder to breathe. There is no cure for COPD emphysema, but there are activities that can help compensate. Breathing exercises emphasize methods for optimizing airflow. For example, something as simple as pursing the lips during exhaling can help. That technique creates a small resistance to the outflow of air. That in turn increases slightly the air pressure on the airways, keeping them as open as possible. Another simple technique alters the way you would naturally breathe. Because it takes longer for less elastic alveoli to expel air, short breaths in, followed by, longer exhalations out can help maximize airflow. A variation involves holding your elbows back to arch your chest, and then hold the inhaled air in for a few seconds. Forcing air out more strongly than normal and moving the elbows back to a natural position follow that. Of course, a physician should perform any diagnosis and treatment. He or she will perform a physical exam, followed up by a series of pulmonary function tests. If COPD emphysema is suspected, a set of follow-on tests, such as a tissue exam after a biopsy, will generate a definitive diagnosis and on that basis, your doctor can recommend a treatment regime to help alleviate symptoms.